President Mirziyoyev wants the legislative branch to become the guardian of his reforms. 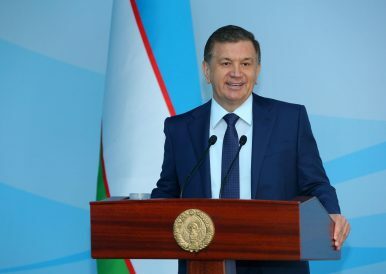 Uzbek President Shavkat Mirziyoyev in his Constitution Day speech on December 8, 2018, spoke extensively of the legislative branch of the government. The legislative branch of Uzbekistan, the Oliy Majlis, like most parliamentary systems is split between the upper house — Senate — and the lower house — the Legislative Chamber. This was not the first time Mirziyoyev has spoken critically of the legislative branch, yet he used the Constitution Day speech to reiterate his discontent in detail. Mirziyoyev’s address specifically pointed out the legislative branch’s poor control over the implementation of laws. Mirziyoyev outlined two issues. First, neither the Senate nor the Legislative Chamber actively uses their mandate to send requests to government entities inquiring about the implementation of particular laws. In 2018, according to Mirziyoyev, the Senate sent only two and the Legislative Chamber only three such inquiries. Second, Mirziyoyev criticized the legislative branch for failing to hold the executive branch accountable. In particular, he emphasized the lack of engagement of deputies and senators with the executive branch’s regular reports to the Oliy Majlis on past and upcoming activities. Mirziyoyev also spoke of the lack of instances in which the legislative body has called out unsatisfied performance of ministers and hokims (mayors). In the same address, Mirziyoyev offered three recommendations to the legislative branch. First, he encouraged the Oliy Majlis to become actively engaged in the implementation of laws and decisions. Second, he encouraged deputies and senators to engage with the population directly and learn about their concerns. Third, he proposed the abandoning of an old practice: adopting bylaws rather than being guided by nationally-passed laws. The latter is a particularly painful matter for Uzbekistan given the country has long functioned under a multitude of secret bylaws rather than directly passed laws. Mirziyoyev spoke extensively to the legislative branch a year ago on December 22, 2017, raising the same issues but in general terms. Then he called on the deputies and senators to become the leaders in the democratic transformation and serve the people of Uzbekistan. His address was one of the earliest to call on the legislative body to “wake up” and work toward improving the lives of people. The president’s latest speech effectively encourages the legislative body to become an extension of his reform program. Instead of just his single voice loudly demanding accountability, he apparently wants to see the 250-person legislative body (150 deputies and 100 senators) become the amplifier of the changes he launches. The legislative branch should become his close ally, a united force that educates, pushes back, and challenges the executive body officials he appoints. It is also revealing that Mirziyoyev views the legislative branch as the driver of reforms more so than his core officials in the executive branch. A legislative body is indeed a powerful body that can keep the executive body in check. But during Uzbekistan’s previous administration, power was always in the hands of the president and a handful of people in his administration and ministries. This form of limited distribution of power is not unique to Uzbekistan. In Central Asia, a boisterous and active parliament only exists in Kyrgyzstan. To assume that Uzbekistan’s legislative branch has been completely mute particularly since the change of the administration is wrong. Starting roughly in mid-2017, there were several instances when both senators and deputies spoke up on particular developments and laws. In December 2018 alone the deputies did not approve the law on budget and taxation policy, criticized the work of the Health Ministry, called the mandatory residential registration (propiska) unjust. Mirziyoyev’s addresses to the legislative branch have consistently carried a message urging those bodies to become active participants and even executors of the ongoing reforms. Mirziyoyev is encouraging the legislative branch to turn into a system to prod the executive body and keep ministries and government enterprises alert. An active legislative body would indeed greatly contribute to the decentralization of power in Uzbekistan and eventual departure from Uzbekistan’s powerful presidential system. Uzbekistan’s legislative branch has the opportunity to evolve away from the nominally independent husk it has been. If the legislative branch transforms as the president of Uzbekistan envisions, the outcome will be an active, independent, second branch of government, altering the political balance of Uzbekistan for good.